Pontrhydfendigaid, being so far from the epicentre of technological change, must have been among one of the last places to join the telegraph network. However, it was eventually connected in 1899, when the local Post Office was linked to the existing railway system at Strata Station. As one would expect, this historic event was reported in the local press. New Telegraph Service - The village in addition to its Post Office, Savings Bank and Money Order Office is to be favoured with a Telegraph Service. Posts have already been set right up from the Railway Station to the village, and ere next week is over it is probable that the service will be open, and telegraphic connection with Aberystwyth and other parts accomplished. The misfortune of having the line route of the Manchester and Milford diverted from Alltddu towards Aberystwyth instead of keeping to the originally proposed course through Bont to Llangurig and Llanidloes has greatly handicapped this village in its usefulness and success. The knowing ones however predict that better times are in store, and should the Birmingham Water Works Co. extend their line to the Claerwen water shed, seven miles from Bont, there will be a good chance of having a connection from Claerwen to Strata. Such a scheme would be greeted with joy not only by Bont people, but others along the route. Being cut away inconveniently from other places the establishment of a Telegraph Service will prove a great boon in a district where many bred-winners are away, and the train service is inconvenient. The Parish Councils took up the matter, but as the village is partly situated in two parishes the two councils could not jointly give the required guarantee except through the Tregaron District Council. That body again cared but little to be bothered . . . other villages also craved for the same guarantee from the R.D.C. (and) it was decided to decline all around. Not to be thwarted, a strong committee was formed with Mr. J.Rees as secretary and voluntarily Mr. Edward Evans J.P., who has a country residence at Bont, and who is always ready to materially support good causes in his native locality came forward offering himself as guarantor. Mr. Jones, Dolfawr, chairman of Gwnnws Upper Parish Council readily joined Mr. Evans, and Messrs Joseph Jones, New Abbey, and Edward Jenkins, Wellington House made up the obliging guarantette. So by to-day matters have reached the end nearly and messages will be received in a few days. Those people who formed the all-important Committee have to be applauded for the part they played in bringing this service to the village. The secretary of the Committee, John Rees (around 46 years of age at that point in time) was the headmaster of the local school and was living with his wife and six children (then) at the nearby School House. John Jones of Dolfawr was born and brought up in Dolfawr farm. He married Thomas Arch’s (of great Abbey farm) eldest daughter, Hannah (Annie), born at Alford in Lincolnshire. It is interesting to note that the 1901 census refers to her as a fluent English and Welsh speaker, but not so John Jones (Welsh only). Joseph Jones (48) was a cattle dealer living at New Abbey. He was born in 1840 at Dolebolion, but the family moved soon afterwards to the neighbouring Abbey farm. The Jones’ were there until the late 1860s (for over a quarter of a century) when they were ‘eased out’ by the owners (the Nanteos Estate) to make way for another Nanteos employee - Thomas Arch. Edward Jenkins was originally from Pontrhydygroes and his wife Margaret came from Pontrhydfendigaid. In the 1891 census he was recorded as a publican in Aberdare, but sometime between then and 1901, he came back to live at Wellington House, Pontrhydfendigaid. He was there for a few years before moving on again - this time a short distance down the road to the Red Lion to become a publican once more. There was another snippet of news in the same edition of the Welsh Gazette. Somebody thought the creosote treated telegraph posts along Heol Sarne (part of the road to Strata Station) gave that road an extra charm. I wonder what people would say today if they were re-introduced. The report is worth reading. Cymanfa Ysgolion - Bont has been the place fixed for holding the Gymanfa on Wednesday, May 31st, the good villagers are at it with a will clearing in and out so as to brighten up the place. The bright sun of the last few days to improve the aspect, and the tall telegraph posts keep watch like sentinels ready to whip up the lazy and point out the busy cleaners. By the by these posts greatly adore the road from Strata to Bont, and lend a charm to the route, while the cottages and the grounds of the buildings of Mr. David Morgan, Liverpool, with the planted Poplar Trees in Poplar Terrace greatly improve the station side of the village. 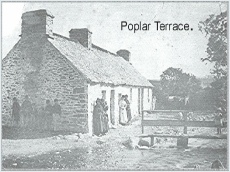 Poplar Terrace is still there but the poplar trees have long gone. In fact, they could not have lasted very long - they were not there some 30 years on.and it is hard to believe that such ‘alien species’ could possibly improve the station side of the village. The misfortune of having the railway line diverted from the original proposed course through Bont to Llangurig and Llanidloes greatly handicapped the village. The telegraph system was one of the technological wonders of the nineteenth century. It was first used by railway companies to regulate train movements and, in its time, it was the fastest known form of communication. There is an interesting story which typifies what people considered fast at that time ; in 1845, a certain John Trowell, who was wanted for murder, fled by train from Slough to London, a distance of around 20 miles. A warning was telegraphed down the line and Trowell was actually caught leaving Paddington Station. From the middle of the 19th century to about 1918, the telegraph was the most important means of exchanging information. Appropriate equipment was installed in most post offices and the telegram (sent by telegraph) became the main form of personal communication. At the peak, the British people were sending 90 million such messages a year. Eventually, however, the telegraph was replaced by the telephone.